I received an email from a wonderful woman who lives on the New Jersey Coast. 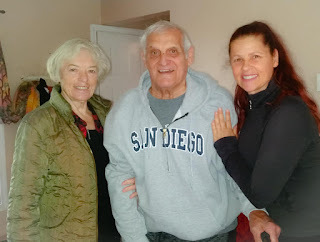 She had read my books and wanted to know if she could fly herself and her 82-year-old stroke survivor husband to Florence Oregon, to train with me. She shard some stories of trainers refusing to work with him and those who did not have the knowledge needed. She also shared a couple stories about physical therapist not wanting to bother with using specific equipment that was needed for him. This is so disappointing. He is now almost 4 years post stroke and she has still searched out some guidance toward a better recovery for him. It saddens me with all that she has gone through, but I am grateful that I could help, the best I know how, in the past four weeks. I made some great life time friends. I am honored that she reached out to me. I am still in “ahh”, by the whole experience. Often stroke survivors and their caregivers do not find the help needed to further their recovery after physical therapy ends. Unfortunately, some survivors do not even get good physical therapy in the crucial, early stages in recovery, when it is essentially needed. She shared with me some not so good experiences she and her husband had faced, like many others I have spoken with. They arrived the last week of September, and we met to train almost every day for 4 weeks. It was a productive training month for him. He made some important gains, but has much more hard work to do. I am helping them find a professional near them with the neuro and biomechanics knowledge, needed to bring him further in recovery. She shared with me that what sold her to come see me was a hand written note I sent to her inside of the book order she had. She ordered “The Stroke of An Artist, The Journey of A Fitness Trainer and a Stroke Survivor.” I knew she would get more out of help with that book if I sent her my second book “Tipping Toward Balance, A Fitness Trainer’s Guide to Stability and Balance.” I included it with the other book as a gift. I had no idea that that would lead to her and her husband taking a journey from the Jersey coast to the Oregon coast to train with me in person. It is very special. I have surveyed 100s of stroke survivors in the challenges they have faced finding good guidance in further recovery. Even though there are good stories, there were a much higher amount of disappointing experiences many survivors and their care givers have faced. Some keep pushing forward and some gave up. For more in-depth coverage on the topic, Tracy has also authored a 4 hour online course with PTontheNet, Stroke Recovery and Exercise. Click here for course details. Article reprinted with permission from Tracy Markley. She’s authored 3 books: “The Stroke of An Artist, The Journey of A Fitness Trainer and A Stroke Survivor” and “Tipping Toward Balance, A Fitness Trainer’s Guide to Stability and Walking” and “Stroke Recovery, What Now? When Physical Therapy Ends, But Your Recovery Continues”. Her books bring hope, knowledge and exercises to those in need, as well as sharing her knowledge and experience with other fitness professionals. What is the MedFit Network (MFN)? A free online resource directory for the community to locate fitness and allied healthcare professionals with a background in prevention, treatment, and rehabilitation in working with those with chronic disease or medical conditions.